If you’re like me, you have a collection of old hard drives. I’ve been using Firewire externals since forever, and $29 USB enclosures from compass since I got my G5 tower. Carbon Copy Cloner happily backs up my Documents folder (You DO keep your desktop clean, don’t you?) onto the hard drive named “USB” every morning at 4 a.m.
Every Saturday, I swap out the drives and put that week’s in the fire safe. It’s a minor pain to insert the hard drive into the enclosure. It’s a much bigger pain taking it out. The ribbon cable is too short and my dainty little fingers have a tell-of-a-hime pulling out that tiny, low-profile, hard-sided, ribbon connector. The white plastic power connector is bigger, but it holds on really tight. People, it’s a real pain in the grasp. So I have a nice big pair of channel-lock pliers . . . 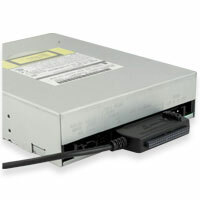 Enter NewerTech and their Universal Drive Adapter. Good for them. it works. I’m a Mac user. I expect things to work. Now here’s the parts I like. The data connector is black plastic, two-sided, 1.2 x 2.5-inches with textured sides for a good grip. You can plug it in and pull it off without assistance from your toolbox. Even the power plug is designed with me in mind. It’s big, rubberized, and comes off handily. Kudos to Newer Tech. At $24.95, you have a winner. The CompUSA enclosure sat on a foam mouse pad with its lid off. But the Newer Tech USB Universal Drive Adapter plugs into a bare hard drive and I don’t really want it sitting and buzzing on top of my tower. Besides, the mouse pad would keep air from circulating under the drive. Using clear silicone caulking, I put four big tall dollops on the mouse pad where the corners of the drive would sit. When the caulking started to set, I took a hard drive protected by Saran Wrap, supported in the middle by a stack of Post-Its and positioned it onto the hardening silicone overnight to make a perfect indention for placement of the current backup drive. Now, my USB drive sits silently on the four silicone feet with lots of air flow. And my pliers are back in the tool box where they belong.